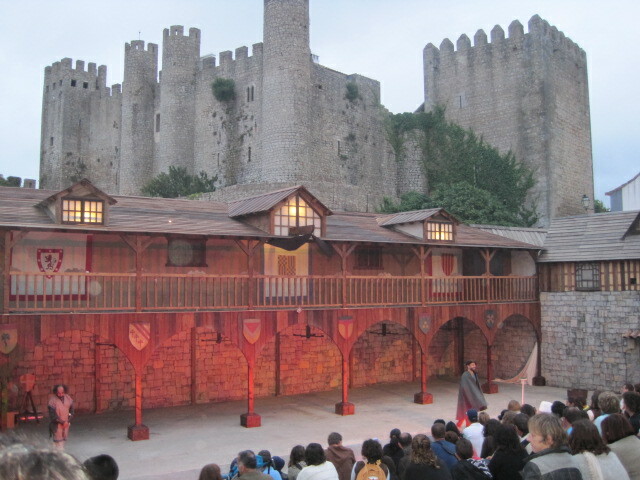 Obidos – chocolate cups and pure theatre! 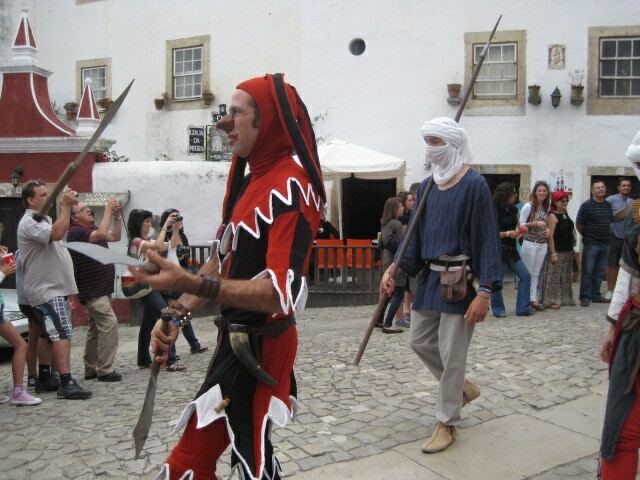 There can be few settings better suited to a Medieval Fair than Obidos- a charismatic walled town, suspended in Central Portugal in a seeming time warp. 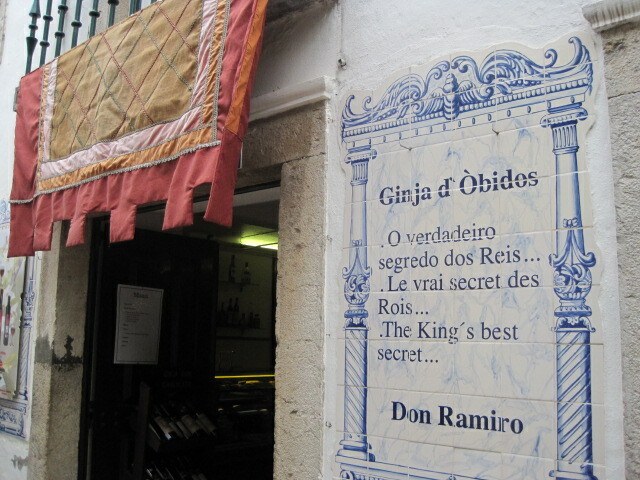 Given to his bride Isabel as a wedding present by King Dinis in 1282, this is one very special small town. 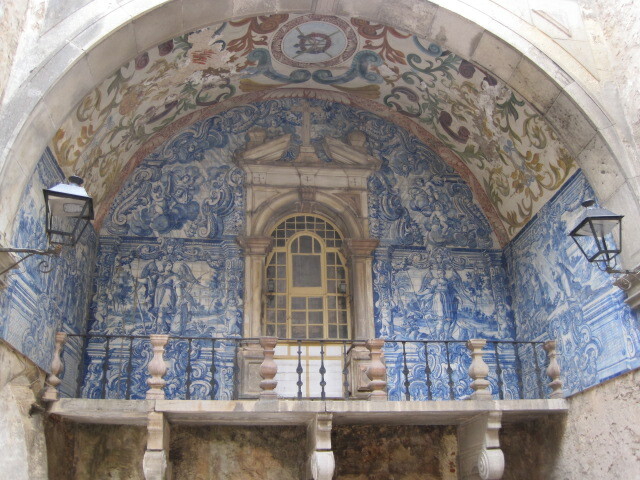 Passing under the Porta da Vila, the main gate, your eye is drawn upwards to a balcony nestled beneath an arch full of azulejos. 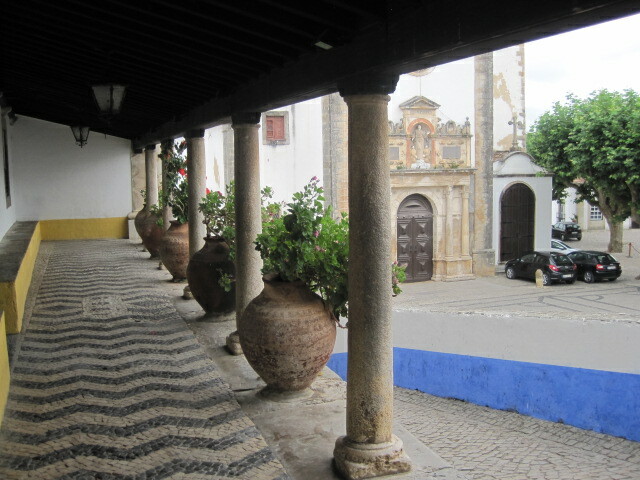 These characteristic blue and white tiles are seen everywhere in Portugal, though rarely to better effect. I had great expectations for my visit but was quite unprepared for what transpired. I was enchanted and completely drawn into the atmosphere of the place. It came as no surprise that maidens with floral crowns wandered the streets, nor that tabards and hose adorned a majority of males. 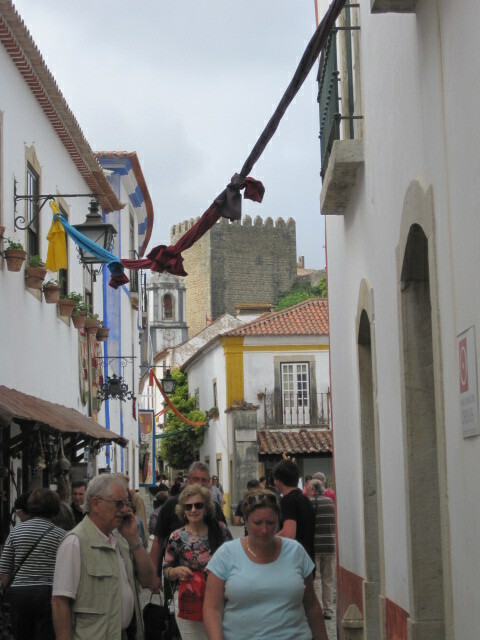 Banners overhead knitted the narrow streets together. Tiny shops beckoned and beguiled. By the castle walls a booth had been erected. 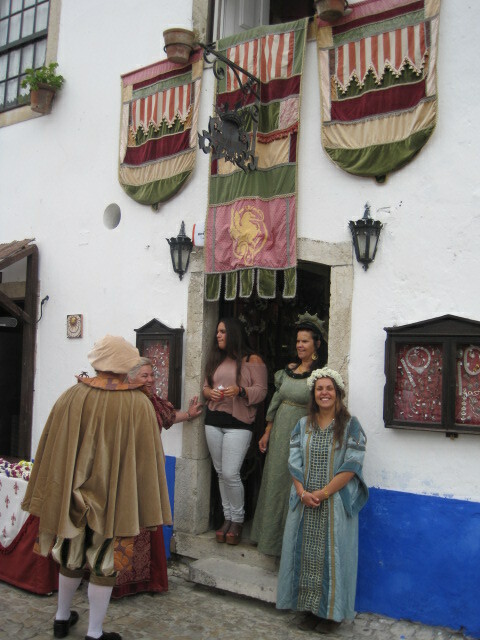 The realisation dawned that I had walked into a Medieval Fair! 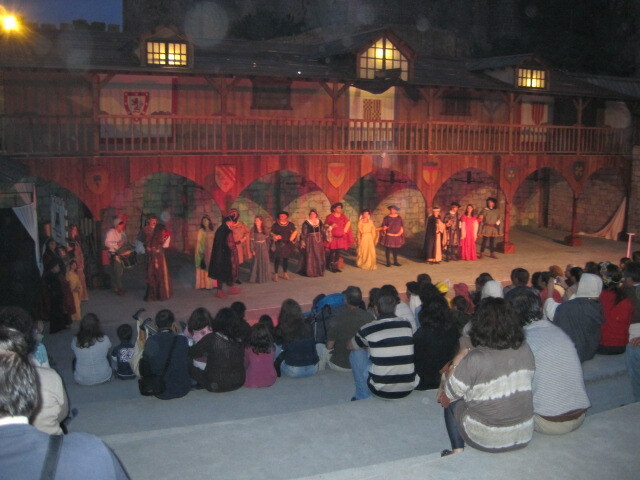 7 euros could buy admission to an evening of entertainment, inside the Castelo, from 5pm till midnight. According to the programme, there was a parade at 6pm. Much jingling of horses and good natured banter preceded it. Finally a disdainful looking knight on horseback wheeled around, summoning his minions. A flare of trumpets and the steady beat of drums and they were off. The hunting dogs looked regal. A juggler and jester entertained. Threading through the narrow streets they circled the town, pausing frequently to engage with their audience. Around the castle, barbecues and food stalls smoked and sizzled. The lights came up as day faded into warm evening. The castle stood tall behind the courtyard. 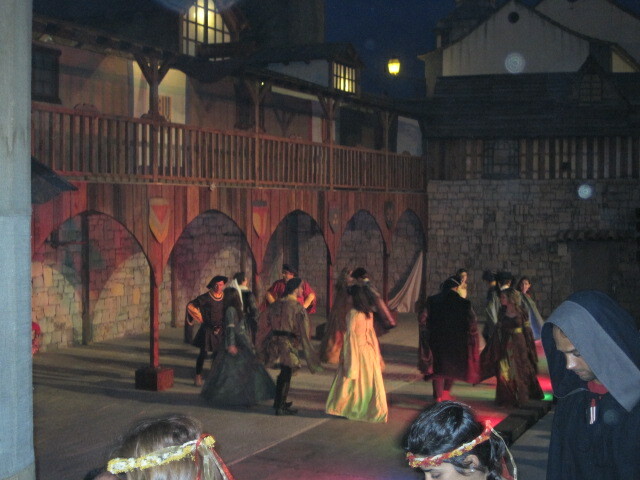 Courtly dancers took to the stage, bowing and dipping to medieval strains. 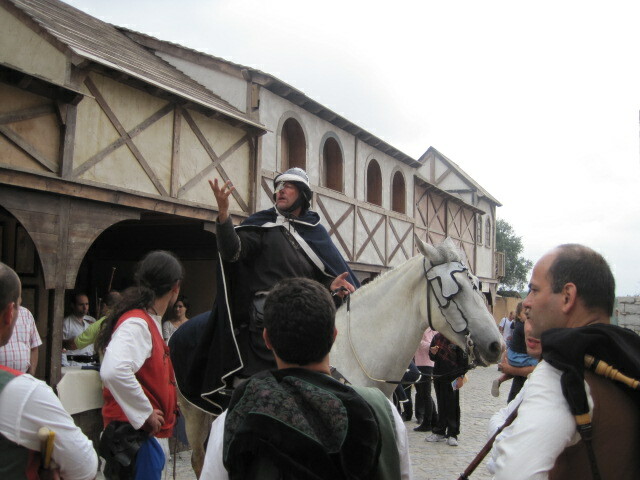 There was Falconry and Jousting. Periodically the drummers leapt in to heighten the atmosphere with their furious thrumming. But unquestionably the star of the show was our jester friend, “the fool”, with an hour or more of silliness and audience involvement. A Portuguese Tommy Cooper, he transcended language, holding the crowd in the palm of his hand. My sides were aching at his antics. Midnight came all too soon. A sweet treat- Ginja d’Obidos Still absorbing sights and sound, it was time to return to the hotel. I planned on a chocolate treat to round off the evening. At intervals along Rua Direita, small counters were set up. On each, delicate, diminutive cups of chocolate awaited the cherry brandy liqueur known as Ginja d’Obidos. First you drink the liqueur, then you eat the chocolate cup. Inspiration! 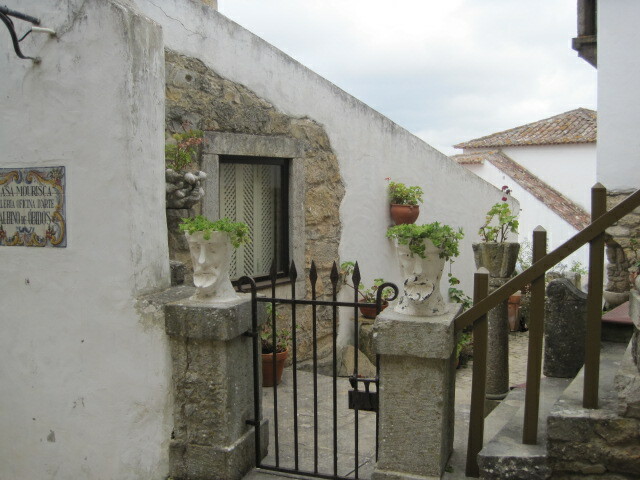 I stayed at the Casa de Relogio, just outside of the town walls, and was made warmly welcome by the owner. Our hire car was parked on a postage stamp of space outside our bedroom window. 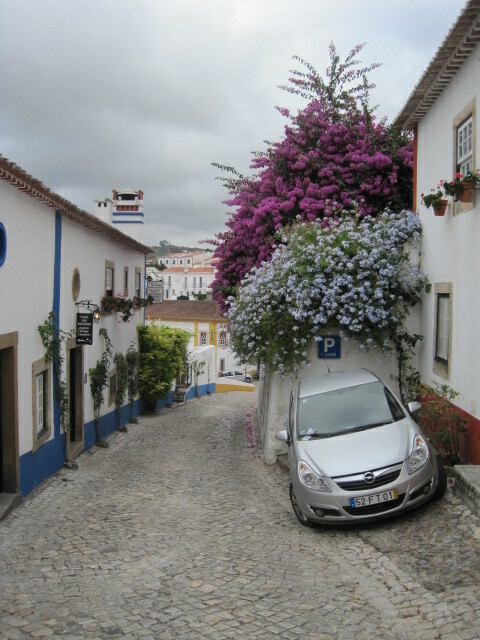 (Rua de Graca, Obidos 2510-999) The towns architecture is quirky and interesting. On a fine day you can walk around the ancient walls, peering down or off to the horizon. 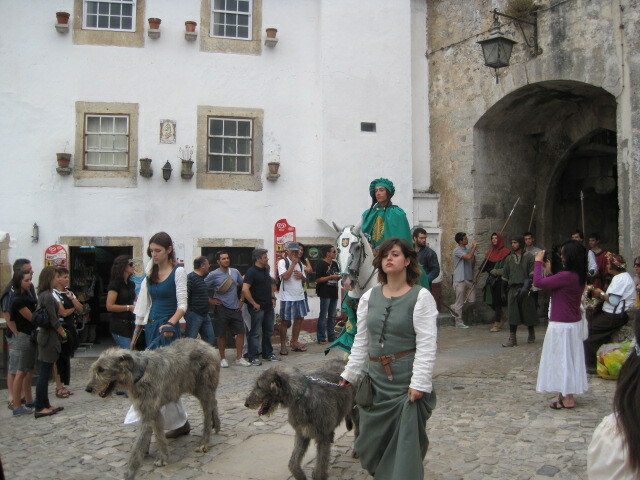 The Medieval Fair takes place in July. Another highlight of the town’s year is the Chocolate Festival in March. Both children and adults can take part in culinary adventures with chocolate, feast upon chocolate and cakes, and wonder at the remarkable display of chocolate sculptures. 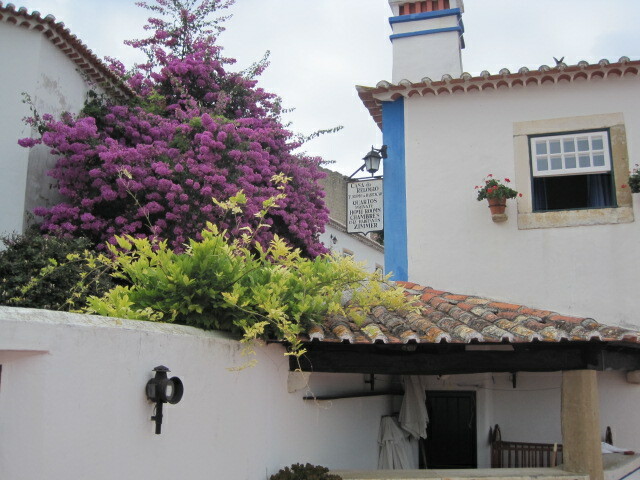 Whenever you choose to visit, I think you’ll find that Obidos has a magic all it’s own. thanks for such review on Óbidos. 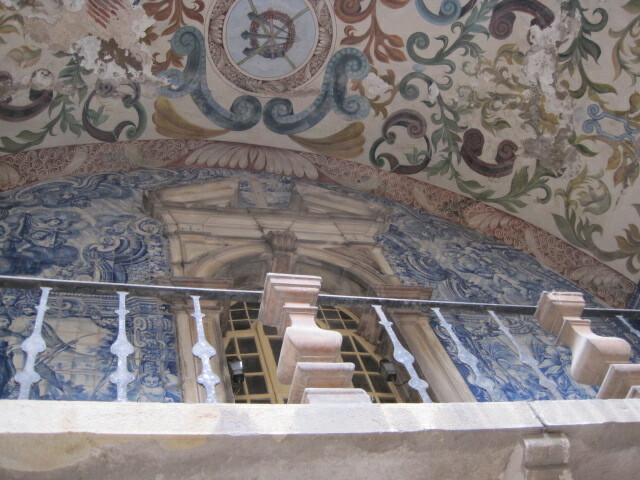 It is an amazing place to visit in Portugal, heretage, ginja and the famous chocolate. 🙂 We saw also that you visit another amazing places like Tomar, where you found amazing wine in the region, besides the central garden and the famous Convent. Both places have amazing festivities. 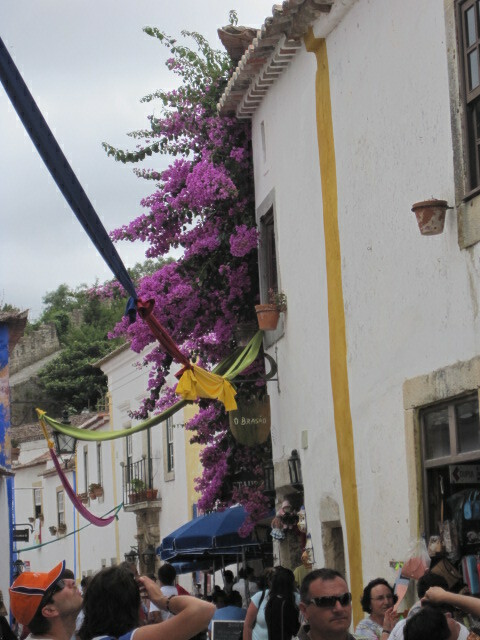 Óbidos has a good Annual Medieval Festival, besides the Chocolate Exhibition and Tomar the “Festa dos Tabuleiros”, with lots of flowers, colours, senses. Beautiful. Algarve? Algarve it is beach, mainly . we suggest you on your next trip to Portugal, Comporta and Tróia. Thanks for amazing review and article on our country. All the best. Glad I accessed this, Jo. Whenever I read your travelwriting, it makes me feel that if I don’t go and visit your recommended places, I will have let you down. You write so well, far better than so many of the professionals that you read in the newspapers’ travel sections. Bless you Murray- you’re too kind as usual. Wow, what a fun event to stumble upon! Thank you very much. Yours is pretty impressive too- love that Missourie sunset! It truly was! Thanks Suzanne..
Great Blog – why haven’t I found it before? Portugal is just wonderful and so often bypassed or considered only to consist of the Algarve. I haven’t been to Lisbon and the south but I have been to Porto a couple of times and visited the far north from Galicia. Thanks so much Andrew. I’m just getting started at the blogging game and appreciate all the help I can get! I love to write though and Portugal provides lots of material. 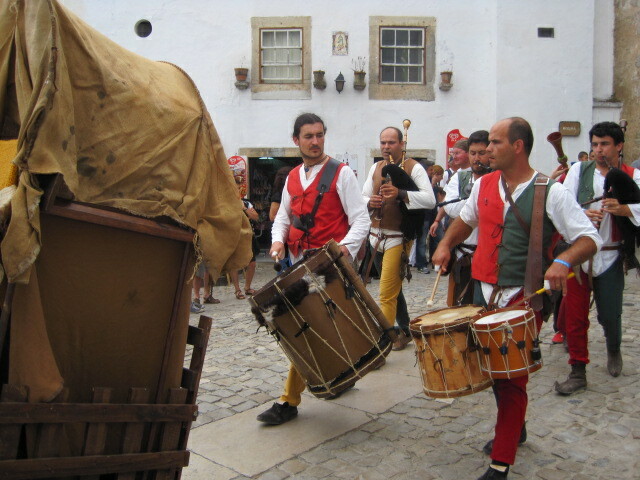 We did a lovely trip taking in Tomar for the Festa dos Tabuleiros (amazing! 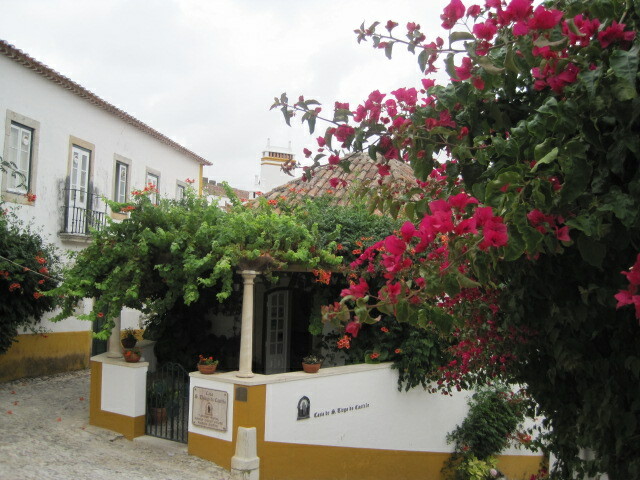 ), Constancia and Obidos. I’m off to Tavira (dreaded Algarve! but the Eastern end which we love)on Friday and will be “sharing” again when I’m back.